With the help of a great crew of students and staff from Proctor Academy we were able to finish up some critical end-of-season close-up tasks. Thanks, as always, for your enthusiasm and your help Proctor! Despite heavy rain leading up to their arrival on Hurricane, this crew of Outward Bound students brought a ton of energy to the island and helped us expand our water-diversion ditch down the hill from the ice pond. Thanks for all of your help! Island Institute Fellows Visit HI! 10 Island Institute Fellows brought a ton of enthusiasm and help to Hurricane yesterday for some service learning. They helped us paint out 42nd street cabin and the back of the lab. They were so efficient they used all our remaining white paint! Hannah Tannebring, one of the fellows, painting out 42nd street. We were excited to welcome 24 Penobscot Bay Stewards to Hurricane Island last week to learn about Hurricane's natural history, ecology, and quarry era. 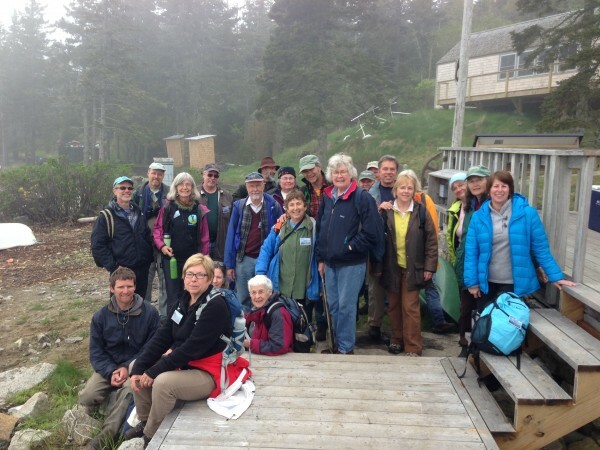 The Stewards Program is sponsored by The Belfast Bay Watershed Coalition in collaboration with the Maine Coastal Program, and provides participants with an opportunity for adults to learn about the Penobscot Bay region and ways to conserve its resources. It meets through the month of May and addresses such topics as Penobscot Bay history, marine life, island ecology, coastal land, intertidal and marine habitats, geology, fisheries, aquaculture, the Penobscot Nation, water quality, conservation issues, and current regional issues with impacts on our environment and human life. After the program ends, each Steward is expected to do at least 30 hours of volunteer work in a related organization or project. We met some wonderful future volunteers through this visit, and look forward to their help and expertise in the future!